These Filled Party Kits are a great idea. It takes the hassle out of endless searching when you are short on time. We have made shopping for party bag fillers easy. With a range of specially selected party fillers all bagged and ready to go. Each party kit comes with a party bag so you just insert them into the bag, This allows you to add extras such as party cake without everything getting messy and falling out. 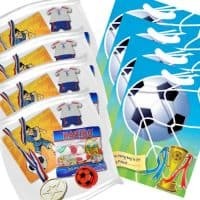 Great ideas and great value filled party bags. Free delivery on orders over £30.